All members, friends, and supporters of the Club are welcome to contact Cary and place your notice here relative to our Club. Yes, folks Tracy and I still have our seasons messed up. IT's Christmas in July time. The celebration is Saturday, July 26th starting at 6:00 p.m. Hope you can join us. --Special training session Sat Aug 10th at Crestview. --Aug 6th-- Fall training is underway at Crestview Elementary every tues and thurs at 6:30pm, PLease make your best effort to be dressed and ready to train promptly at 6:30pm. If you arrive late---three laps and stretch on your own before participating with the team training. 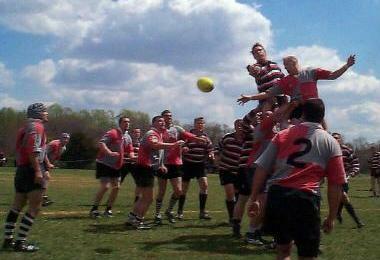 ---Va Gents train March 17th Sunday 2:00pm @ Dorey to prepare for Raleigh road trip. The Lads are welcome to join us for this run---we will just run through our restarts to some touch rugby-come on. ---VCU v VCU Old Boys April 27th @ Leigh St 1:00pm--United and Va. Gents fill out the VCU side--contact Reyn Kinzey for more info. ---Reyn Kinzey wants to know if you want to go river rafting with City of Derry RFC after the Porter Cup. More emails pertinent to this subject archived here. ---Eric Payne has custom rugby balls and club polos for sale. $25 for the ball and $30 for the polo. Combo package $50. ---As of Feb 28th we have two deposits on board for the Caribbean fall tour.Its easy--pay online if you wish. ---We still need volunteers for the Porter Cup. ---We need your bus deposit now for the Raleigh fixture March 23rd. Get your dollars $20 to "Boog". Do it online! Click here.